July 10, 2008: Apple launches the App Store, an online hub that lets iPhone owners browse and download apps made by third-party developers. Transforming the iPhone from a locked-down platform to a generative one, the App Store means that every iPhone user can have his or her own “killer app” depending on the software they want — from social networking to composing music to playing games. One of the most significant launches in Apple history, the App Store opens up a whole new revenue stream for Cupertino. It’s hard to believe that Steve Jobs was originally dead-set against it! Apple had already proven its store for paid downloads concept five years before the App Store, courtesy of iTunes. Launched in 2003, five years later iTunes was already well on its way to becoming the largest music vendor worldwide. A software-focused version of iTunes therefore made all the sense in the world. It wouldn’t even require Apple to broker deals with giant companies the way iTunes did. Instead, developers would submit their apps to Apple. This time around, Cupertino did not need to persuade entertainment industry titans to take a gamble on a new way of selling their product. For a while, the idiosyncratic Jobs refused, though. His main fear was that allowing third-party apps on the iPhone risked watering down Apple’s level of control. Part of this was the potential security threat of third-party apps. But part of it was just that Jobs hated the idea of poorly designed software sullying his beautiful new creation. However, others inside Apple — particularly Phil Schiller and Apple board member Art Levinson — saw the potential of the App Store. They lobbied for Jobs to change his position and eventually succeeded. In March 2008, Apple announced the start of what became the iPhone Developer Program. Developers who wanted to launch apps on the iPhone paid a standard $99 annual fee. (A higher-priced enterprise tier was initially available only to companies with more than 500 employees.) Developers received 70 percent of the sales revenue from their apps, with Cupertino taking the other 30 percent. By the time the App Store opened on July 10, 2008, 500 third-party apps were available, with 25 percent of them free to download. 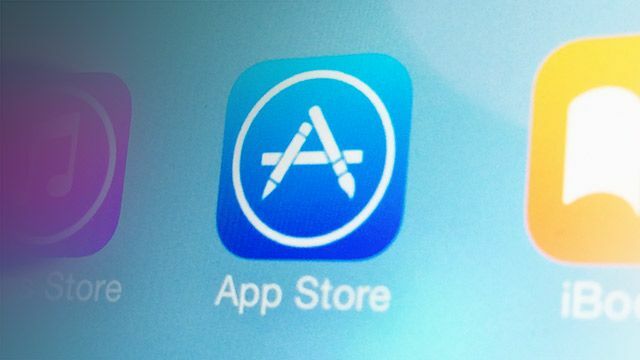 The App Store became an immediate success for Apple, garnering a massive 10 million downloads in its first 72 hours. Developers who jumped on the App Store train from Day 1 reaped rich rewards. For example, a 28-year-old programmer named Steve Demeter created a sliding blocks puzzle game called Trism that made use of the iPhone’s accelerometer. 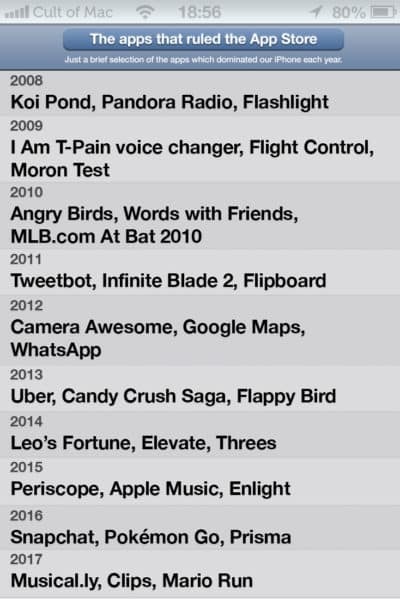 Selling Trism for $5, he made $250,000 within the first two months of the App Store. The odds of landing a hit decreased as more and more apps flooded into the App Store. However, the growing number of iPhone (and later iPad) users meant that the App Store provided a whole new way for developers to make a living. Since its launch, the App Store has gone from strength to strength. By September 2008, it racked up 100 million downloads. By April 2009, it hit 1 billion. A decade on in 2018, we can pick from around 2.1 million apps, which have been downloaded more than 200 billion times. Today, the idea of an App Store is no longer an Apple exclusive. In a July 2011 court case with Amazon, Apple lost proprietary use of the term “App Store.” That opened up the possibility of rival services calling their own app stores by the phrase Apple popularized. Nonetheless, Apple’s App Store continues to be ridiculously profitable for the company — and a major selling point for Apple users. No wonder Apple co-founder Steve Wozniak called it Apple’s most important invention. For a company that made the Apple II, Mac, iPod, iPhone and far more, that’s high praise indeed.